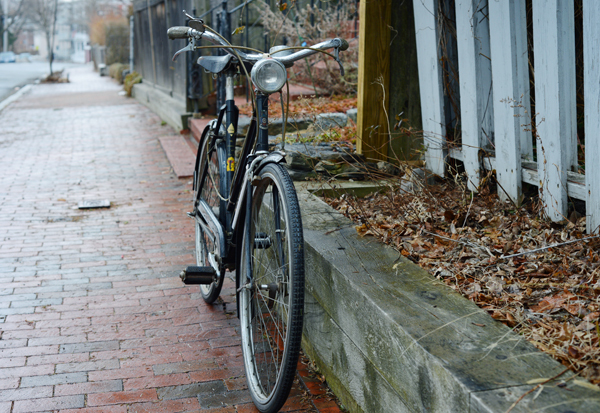 In the cavernous depths of Boston's Three Speed Hub, the humble black step-through looked like a garden variety vintage 3-speed. Smallish and plain of ornament it seemed downright unremarkable next to its freakishly collectable turn of the 20th century neighbours. But as I made my way past it, from the corner of my eye I glimpsed a little something that made me examine it closer - ultimately dragging it out into daylight. 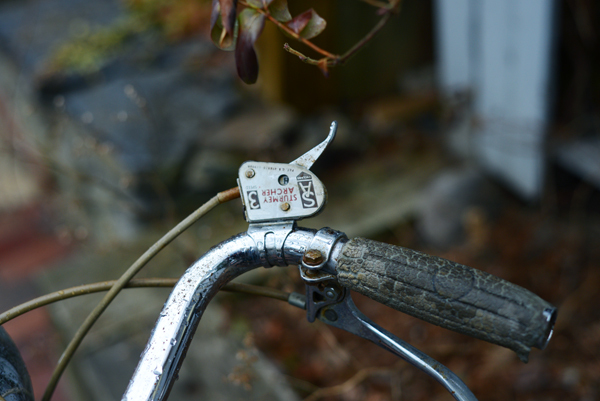 And there, by the creaking garden gate and under threat of rain, I stood and marveled at that deliciously bizarre feature that distinguished Humber bicycles from other English 3-speeds of its era. That's right. In leu of standard fork blades, Humber devised a fork with skinny twin blades on each side. growing closer together toward the dropout socket. Exciting isn't it? Okay, so maybe I need to get out more …but still! I mean come on, they are twin fork blades! Founded in 1868 in Beeston, England, Humber Cycles were a brand that has always struck me as largely fictional. 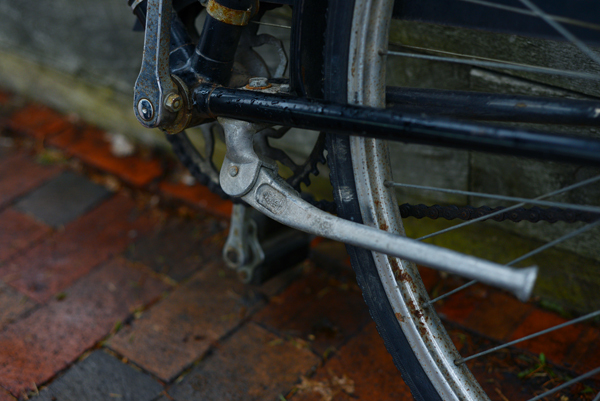 By the 1900s - when they began manufacturing bicycles as we know them today - original owner Thomas Humber had already sold the company and it was headed, as far as I can tell, by a marketing entity. 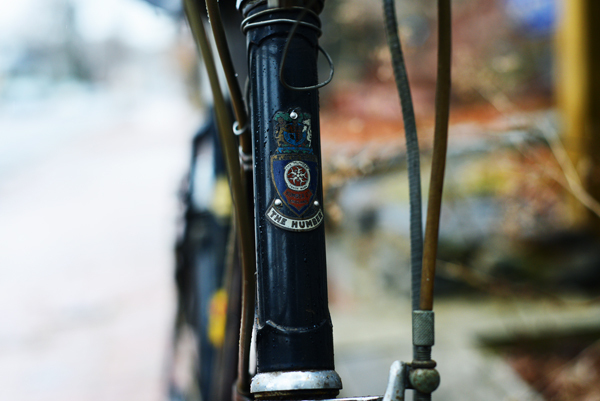 This could explain why, at a time when other bicycle manufacturers were making efforts to become more accessible to the general population, Humber boldly branded itself as "The Aristocrat of All Bicycles" (inscribed on the seat tube decal) - boasting a superior build quality and a plusher ride feel than its competitors. Naturally, these alleged advantages were reflected in the price. "Not cheap, but good," the adverts assured. 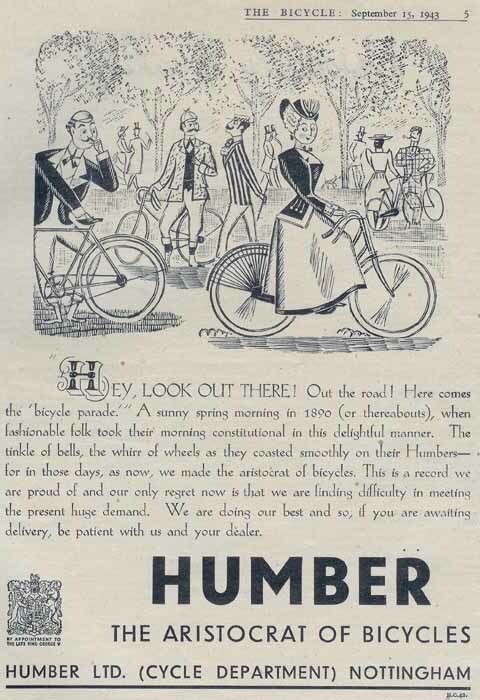 Having seen lots of Humber ephemera before ever glimpsing an actual bike, I've wondered whether perceptions of these bicycles at the time reflected the marketing message. After all, by 1932 Humber was sold to Raleigh, essentially becoming just another of its sub-brands. But when I asked this question in Northern Ireland, those who remembered the days when Humbers were sold in shops new, said that indeed they were considered high-end bikes and valued as such. 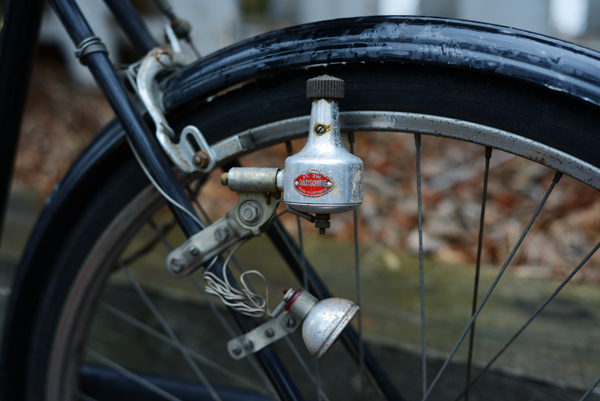 And although owned by Raleigh since the '30s, Humbers were always made according to their own design - including the unique Duplex Fork. Another distinguishing feature of the Humber is the Maypole Chainring - a ring design that features 5 dancers in a circle, presumably around a maypole. It is not clear where this design came from. Recently, a Wheel of Life plaque with a more detailed, relief version has been put up on Humber Street in Beeston. That aside, this specific Humber has a number of neat features. The most striking is the enormous Rollfast cyclometer. Larger than a coffee mug in diameter, it displays moving speed and miles ridden. And plugs into a plate of sorts at the axel. As far as I can tell the cyclometer still works. 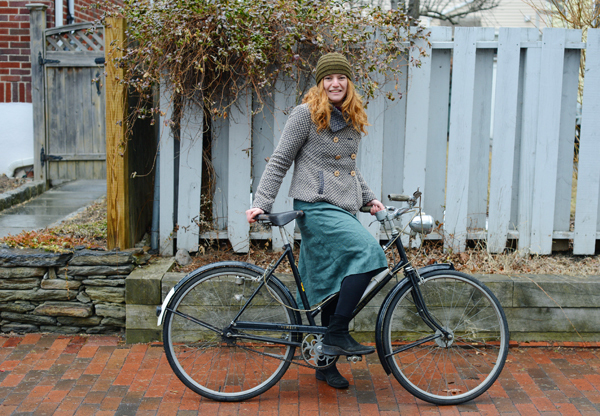 There are 1,396 miles on this bicycle, according to the counter. The lighting is bottle generator powered Radsonne, headlight and tail light. The bottle is at the back, clipped on to the left rear stay. 3-speed Sturmey Archer gearing - the gears labeled high (H), neutral (N) and low (L) rather than 1-3. And a Brooks B72L (ladies?) saddle. Interestingly, this bicycle seems to have come with (stock) upgrades of an aluminum seatpost and rear hub to make it "sportier." However, the wheel rims are steel. 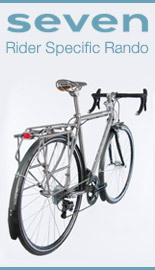 Being a Sports model, this step-through was designed around 26" wheels, with a shorter wheelbase, steeper angles, and a lower bottom bracket than the more stately Roadster models, as well as with a brazed, rather than bolted, seat cluster, and with caliper brakes in leu of rod brakes. Date of manufacture is 1956. In person this Humber looks very compact - tiny even - but once I got on, it felt like a perfect fit. The cockpit was not cramped at all, there was no toe overlap, and the North Road handlebars were easily set level with the saddle, which is my preference for upright bikes. According to the speedometer I was doing 10-12mph straight out of the gate. Sporty! But I know that, with bated breath, you are all waiting to hear about the Duplex Forks. Do they indeed deliver a superior ride quality experience worthy of the title "Aristocrat of All Bicycles?" Well, I will say this much. This is one fine riding bicycle. Finer, for example (as in smoother, cushier, and at the same time more responsive) than a Raleigh Ladies Sports of the same era. It was so nice I did not want to stop riding it, wishing instead to whisper sweet nothings into its ear as we cycled off into the sunset, enormous cyclometer clicking away to the tune of our bliss... But whether it's the weirdo fork construction that's responsible for this or something else entirely, is difficult to tell. While the official line was that the Duplex Forks were a design feature to improve ride feel, in reality the manufacturers of the time often just wanted to find a way to visually differentiate their product. 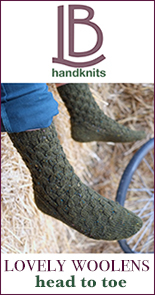 Hetchins had their vibrant stays. Bates had their diadrant forks. Baines had their flying gate frame. And so the duplex forks were Humber's distinguishing feature. 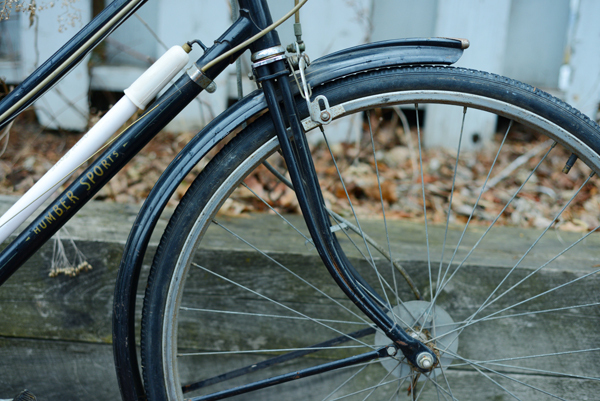 Whether ultimately useful or decorative, they are a part of bicycle manufacturing history. And getting to look at, touch and ride one of these fairly rare machines was an exciting experience - for which I thank Nick at the Three Speed Hub heartily. That's the prettiest chain ring I've ever seen. 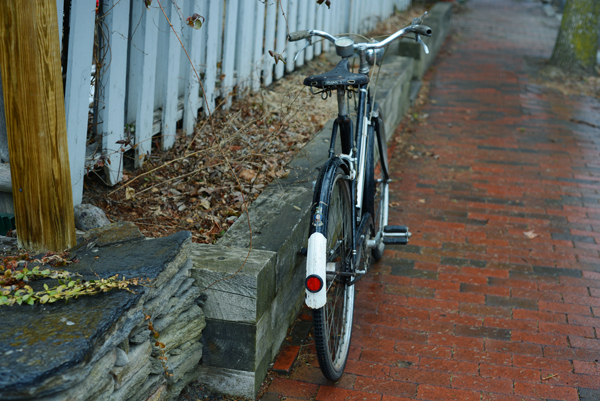 On an irrelevant note, as someone who has constructed retaining walls from field stones (with mixed results), I would like to whisper sweet nothings to the dry-stack stone walls that often grace the "glamor shots" you take of bikes in the Boston area. Apparently, you've got a bunch of good stone masons up there. I assume this bike was for sale? What does something like this sell for in the Boston area and is something like this used (in your experience) as a riding bike or something else? This specific bike is from a personal collection, but Nick assures me he can source similar - so a Humber could be for sale there soon. The thing is, they are so unusual that there is no "standard" Boston price. It depends on the condition, model, and on how knowledgeable the seller is. Okay...It sounds like you're saying this is a collectors item. It may be rideable but it's market value has more to do with other things. I was just wondering if this was in the tens of dollars, the hundreds or, gasp, more. In the hundreds would be the safe answer. This particular model/year would not be a collectible bike. Just unusual compared to other English 3-speeds. And the price variability is not specific to this make and model. 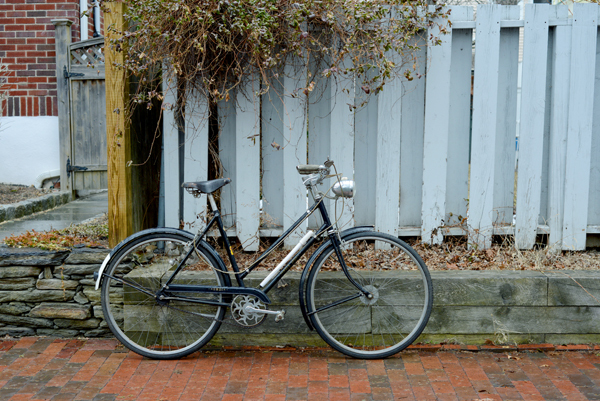 I have seen 1950s Raleigh Ladies Sports bicycles sell for anywhere from sub-$50 to over $500 in Boston and NYC. Again depending on condition and seller. That is the price range. But there is no market as such for these bikes. I've had this '49 for a while now. I can't sell it to someone who wants to 'upgrade' with an Alfine hub and 650B wheels. 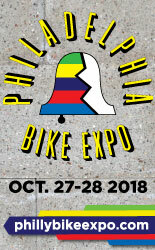 I can't sell a 23" frame to a 5'9" buyer who asks if I can supply an extralong seatpost. I can't sell to someone who's never tried a quadrant shifter, won't spend ten seconds learning, but can deliver a dissertation on how bad quadrant ergonomics are. So the bike is not for sale. Sooner or later I'll meet an appropriate taker and a low price will be offered. Or it becomes another giveaway. To any who are looking to buy I would say be patient. There are many more of these bikes than there are riders interested. Standing ready with a wad of cash might make your search quicker, it's not necessary and it does not automatically get the best bike. That looks like a beautiful bicycle. So far, my only 3 speed bikes have been Schwinns but would love to have one made in England. Usually I rebuild them without restoring them and would do the same with something like this. 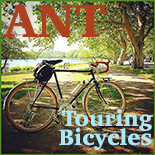 I am overwhelmed with projects, mostly Bontragers, right now in addition to maintaining my regularly ridden bikes. Currently, I'm working on a 2000 Trek STP 400 for a woman friend, her old race bike. An interesting bicycle actually. Atcaluly, as rgerdas spleilng, aoccdrnig to a rscheraecehr at Cmabrigde Uinervtisy, it deosn't mttaer in waht oredr the ltteers in a wrod are, the olny iprmoatnt tihng is taht the frist and lsat ltteer be in the rghit pclae. The rset can be a cmeotple and utetr smaelhbs and you can sitll raed it wouthit a porbelm. Tihs is bcuseae the huamn mnid deos not raed ervey lteter by istlef but the wrod as a wlohe. Azmanig, huh? I uesd to tinhk slpeling was ipmrtonat too, but not any mroe! Those forks are heavy. They weren't taking any chances. The mass of the fork cancels any theoretical difference in ride character. I used to care for a '58 Humber for an ex-girlfriend, She kept me 2 years, she had the bike 30 years I know of. It was on the small side for me but I rode it around a good bit. It did ride very well. 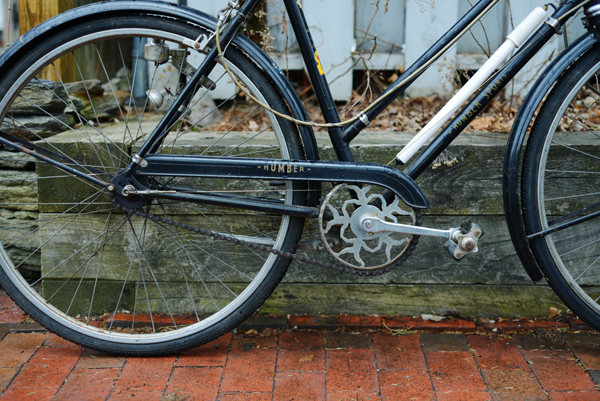 Any difference between the Humber and a similar Raleigh is far more likely due to maintenance/tuning/setup than to any intrinsic difference in the frame. 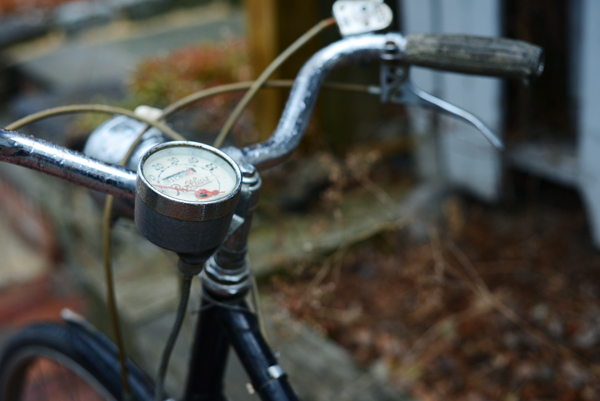 Going back more than 50 years Raleigh did produce bikes with the normal paint decals and equipage that had some small difference in frame construction or dimension. There are Sports frames with evident handwork and attention to detail. Small differences can make a frame real nice for a particular user. But they are all Nottingham bikes. While there was plenty of variation coming out of the Nottingham factory over the years, whatever you may have noticed in this frame shouldn't be chalked up to a Humber vs Raleigh vs Rudge thing; those drop-outs are a dead give-away that this is a run-of-the-mill Nottingham "Sports" frame, with the sprocket and fork being unique so as to add some sizzle to the badge-engineering that Raleigh was operating under in those times. Some of us, when we were young, played with hacksaws. Finding a Raleigh with folded stays and cutting it to bits is about as much fun as a boy can have. What you find when you cut them open is that the construction is casual. The strength of the joint is in that big long heavy lug. The tubes do not meet inside the lug. At all. The gaps are big enough that top tube length on two identical Sports could easily be 1/2" different. Variations like that can alter head and seat angle. So sure some frames ride a little different. And it doesn't that much matter. The basic design is sound. Most frames last a very long time before they break. 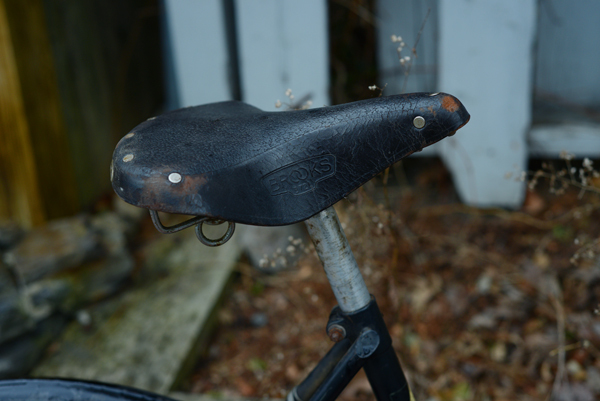 The common breakages - detached seat stays come to mind - are easy fixes. And they ride well. As the years go by you will see frame breakage from badly cut and fitted tubes on bikes with stickers from revered builders. Frames that have been loved. And again it doesn't much matter. From Nottingham one of the big exceptions is forks. Before '62 some of the forks are fine metalwork. The ones I'm thinking of will usually have initials stamped in the dropout. Well I'd like to think they were initials. Could be it was just some stock control system. Regardless there are some beautiful forks out there. I was intrigued by the picture of the crankset, so I saved it to my computer and zoomed in. The chainring looks like dancers with hands joined, playing ring around the rosy. Some of those steel cranks were really cool. Uh, maybe it would help if I actually read your post all the way through before spouting off. I'd be curious to hear your impressions of a pre-Raleigh-era Hercules and some of the 1940s- 50s Phillips bikes in this same ISO 590-wheeled "Sports" configuration. They ride quite differently from each other, at least to my sensibilities. And yeah, dry fieldstone walls are cool. 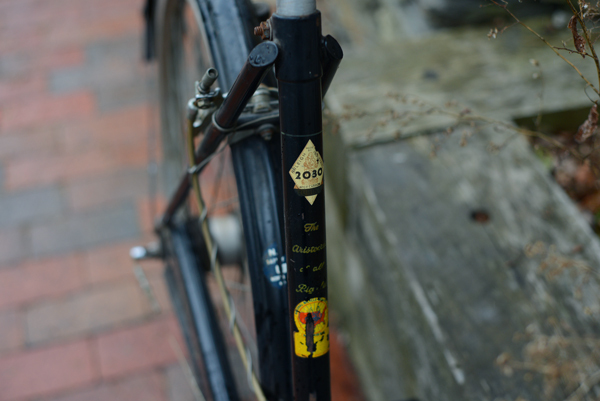 I have never tried those, but it turns out that my Triumph Sports is pre-Raleigh, most likely early '50s. I like both it and the Royal Enfield Sports I tried earlier better than a Raleigh Sports. Which is not to say that I dislike the Raleigh Sports, quite the opposite. Only that these other bikes felt nicer still. Many years ago my father pointed out to me when I referred to the middle gear of my three speed as neutral, the N means normal, not neutral. Hmm...Could that be the right fork for a mixte frame? What does "fine riding" actually mean in context - slow and stately, fast and smooth enough, light and steady. Slow or slower, high frequency vibrations gone. I can't imagine anything that old riding less than fine, so this bike is about the details I suppose. Like a car speedometer or a fork as a solution in need of a problem. So did you feel an unusual amount of flex in the fork? Can't say that I did. The bike had a plush ride feel to it "holistically" but I did not sense a flex or suspension type feel in the fork specifically. For anyone reading the comments - stumbled upon this thread about a reproduction fork made by a builder last year. You forgot Ahearne did one. I have debated if to post this, and so Velouria I leave the final decision in your hands. Being an enthusiast for old bikes, particularly old three speeds and my wife being a jeweler we made pendants of some classic chainrings. The Humber Maypole design is one...and incidentally the one I wear. To hopefully keep from offending anyone for the selfish plug I did add a coupon code "LovelyBicycle" for free shipping in the US. good until next Friday the 21st. Again, feel free to delete this post if you decide it inappropriate. There will be no hard feelings, II will continue to read and enjoy every post as I have for the last few years. Saw that when looking up info about the chainring! Here's a clickable link for anyone interested. I've never seen a double fork. The crank really intrigues me. I've seen a more modern take on dancing figures holding hands - portrayed in a magical context in the animation, Howle's Moving Castle. The unique design elements may not be functionally necessary but certainly do bring unique personality to the brand. Something sorely missing among many offerings today. A refurb project I'm most looking forward to! 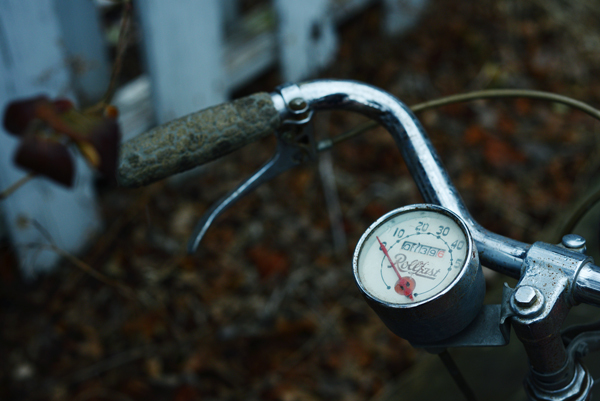 The third in the trio of Raleigh owned top tier brands is Rudge, with their own fork crown and crank. 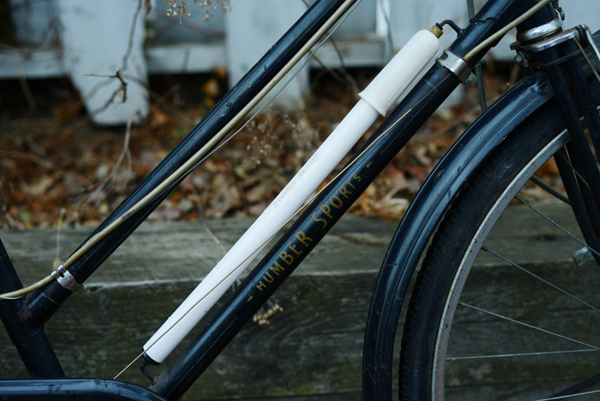 Historically, I believe the patent on the Duplex Fork was held by Centaur; Humber took over Centaur in 1910 after Centaur’s owner died, and I guess they inherited the patent and the fork, at least in principle. I suppose the ultimate evolution of the duplex fork is the Jones truss fork. Jeff Jones is one of the most innovative/inventive builders out there, but like your friend and mentor Antbike Mike Flanagan, he’s a student of bicycle history – apparently Jones would tell you “all the best info is pre-1930.” The Jones spaceframe is essentially a swoopy Centaur Featherweight (albeit without separate seat stays, so that the seatpost is allowed to flex backwards – the Centaur had a harsh ride), and whether or not it was specifically influenced by the Centaur or earlier crossframes, or later ‘Pastoorsfiets’ like the Simplex, Junkers or Locomotief, he didn’t just pluck these concepts out of the ether. Whichever way duplex (or truss) forks work, or even whether they do or not, they’re seriously cool! P.S. 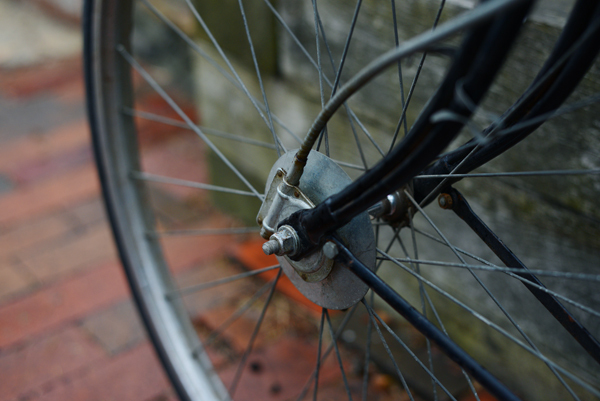 Hats off to George Gilbert, who engineered the Centaurs – one of the (many) unsung heroes of bicycle engineering. Amazing links. Thanks so much. Noted the 1901 Centaur was priced at 25 pounds sterling. An enormous amount of cash then. Enough to create special things. Duplex forks were invented before tapered fork blades were invented. Prior to that most forks were straight-guage, constant diameter rubes, with pressed ends instead of drop-outs. As you can see, even on the Humber fork, they don't have proper dropouts as we know them today. As far as the aristocratic moniker, that comes from the fact that (his majesty) King George V rode one as his personal bicycle, and was one of the, if not the first British Royal to publicly enjoy riding a bicycle. 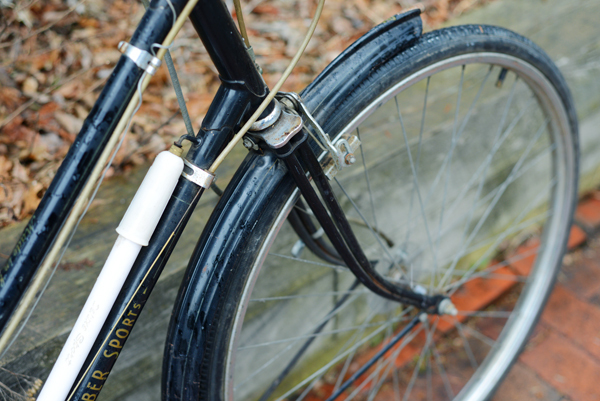 Eventually Humbers lost their duplex forks and were supplied with rather generic Raleigh-made forks as Raleigh seriously started sidelining the other brands. It did remain as one of the flagship brands along with Rudge, also known for the unique chainring. 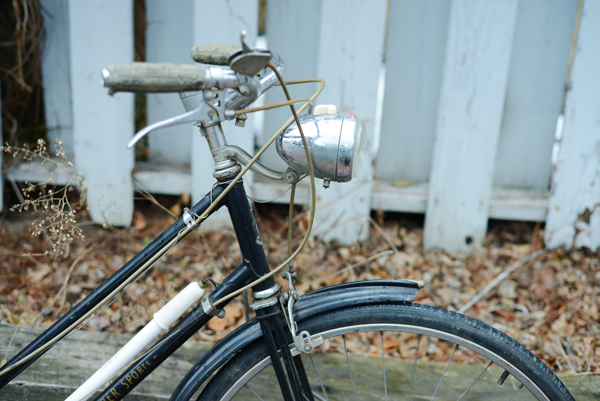 My first 'real' bike in 1963 was a used late-50s Humber purchased from the Central Wheel Shop in West Hartford, CT. They didn't believe in those new-fangled '10-speeds' or the newly-popular 'banana bikes' from Schwinn and others. 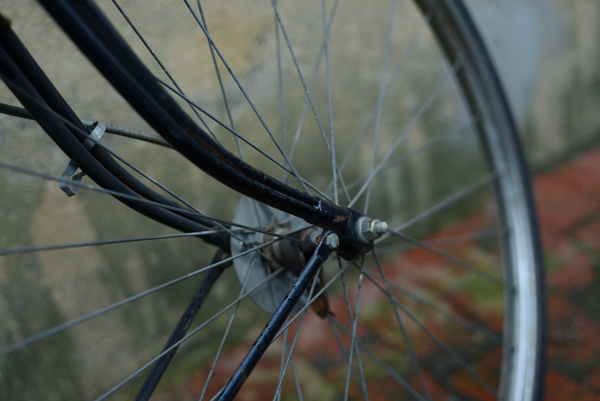 The Humber served me well for years, and its Maypole chainring hangs in my shop today. My daughter Madeline has a BRG one ,rod brake, gearcase and dynohub. 26" wheel. One of the nicest roadsters I have ever seen! 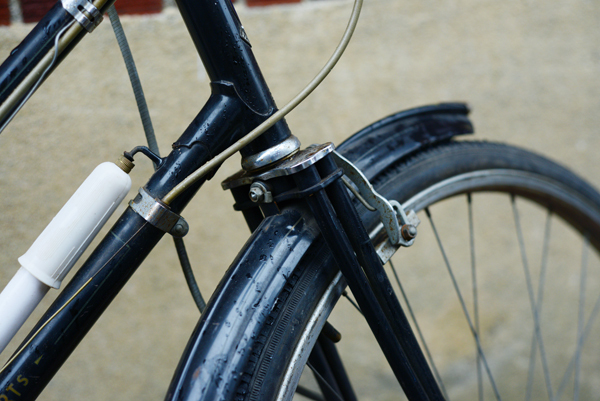 Just stumbled across your Humber post....I recently acquired a 1949 men's version of your bike, and if I am not mistaken have the same paint issue as you seem to have - is your bike blue where the colour still shows? Great article, and just waiting for the ice to melt to take mine out for its inaugural spin, after having renovated the mechanicals. Oh, and mine has the allow AW hub too! I just saw a his and her pair an an antique parts / architectural shop downtown Kalamazoo Michigan. $550ish for the pair. They were sweet. They had hub generators! This is the place I found them, if anyone is interested. The more I read through this post and looked at the pictures, the more I found myself smiling. That is a really lovely bicycle (can't call a machine like this a "bike"!) - and a great photo of you with it, your face says it all! Smashing.